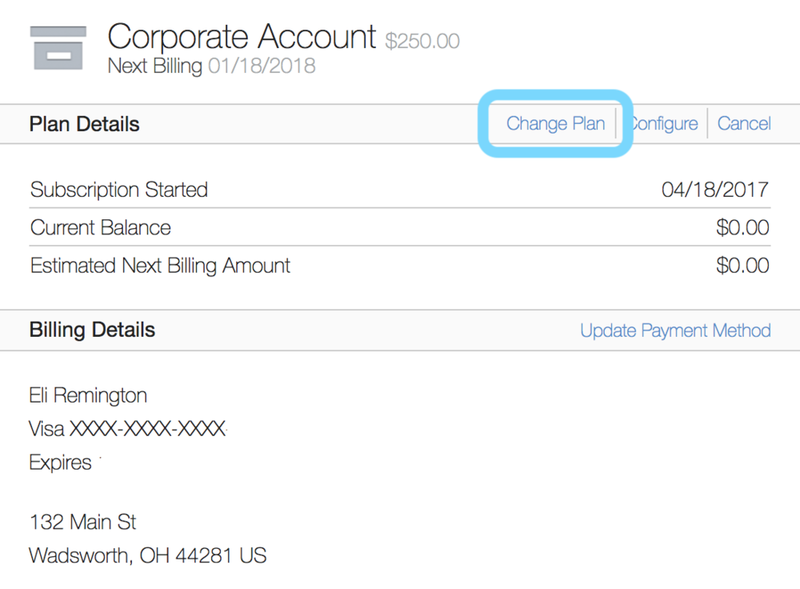 We’re making a change to our billing portal. When adding additional users, you will now need to contact your account rep to add them to your account. If you are unsure of who that is, please contact us and we will get that information to you. To upgrade or downgrade your account, or to add or remove user licenses to your account, you will need to visit the Bezlio billing center. 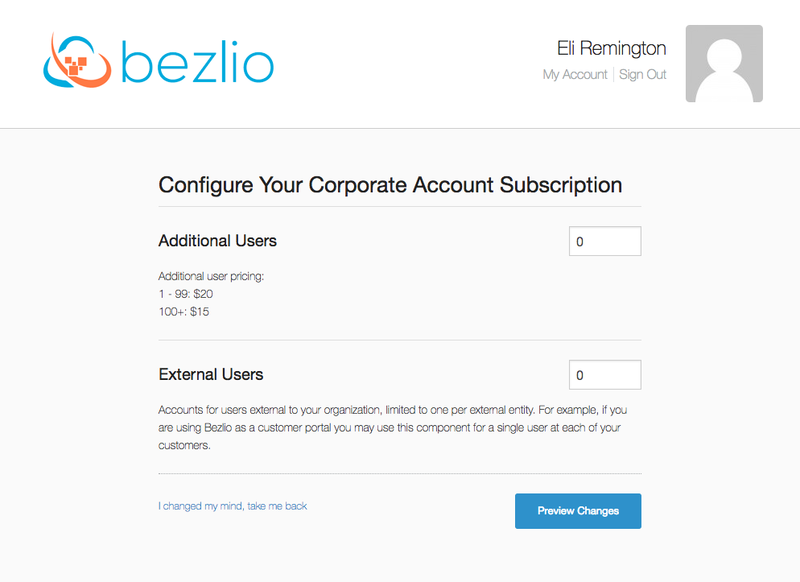 Click on your name in the upper right corner of the Bezlio Portal screen and then select "Access Billing". 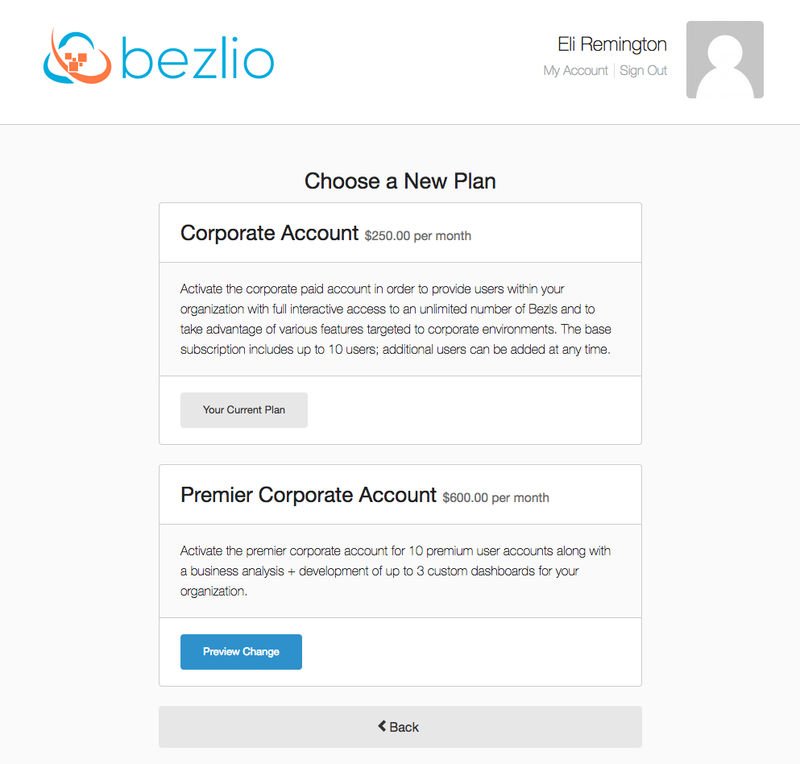 If you would like to change or add a new subscription to Bezlio, start by clicking the "Change Plan" link. Here you will see your current plan and any other available plans to which you can subscribe. Click the blue buttons to activate another plan. You will be asked to review the payment method, the charges, and the change notes affecting your account. Click the blue button to confirm the plan change. You can add additional users to your account. Start by clicking the "Configure" link. You will see two available fields to add additional users: Users and External Users. What is the difference? Traditional user accounts are for users internal to your organization. These would be employees or contractors that work for you and that need day-to-day access. External users are accounts for users external to your organization, limited to one per external entity. For example, if you are using Bezlio as a customer portal you may use this component for a single user at each of your customers. Enter the number of additional users and click the blue "Preview Changes" button. You will be asked to review the user account change, the prorated charges or credits, and any required payment information. Click the blue button to confirm the plan change. 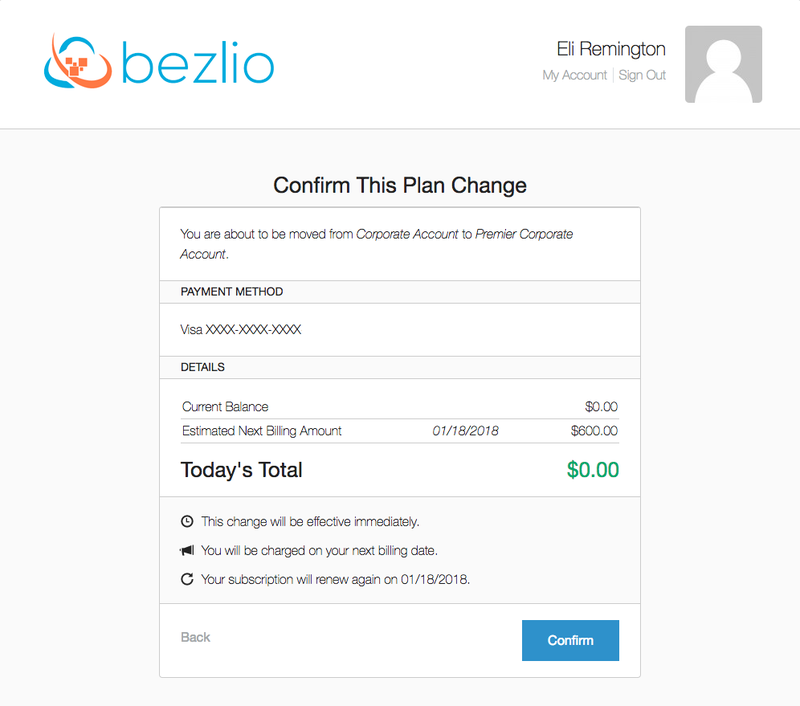 If you need to cancel your Bezlio plan, you can start this process by clicking the "Cancel" link. On the cancel confirmation screen, let us know what we could have done better and then choose to cancel immediately or at the end of the current billing period. You can update the payment method associated with your account. Start by clicking the "Update Payment Method" link. 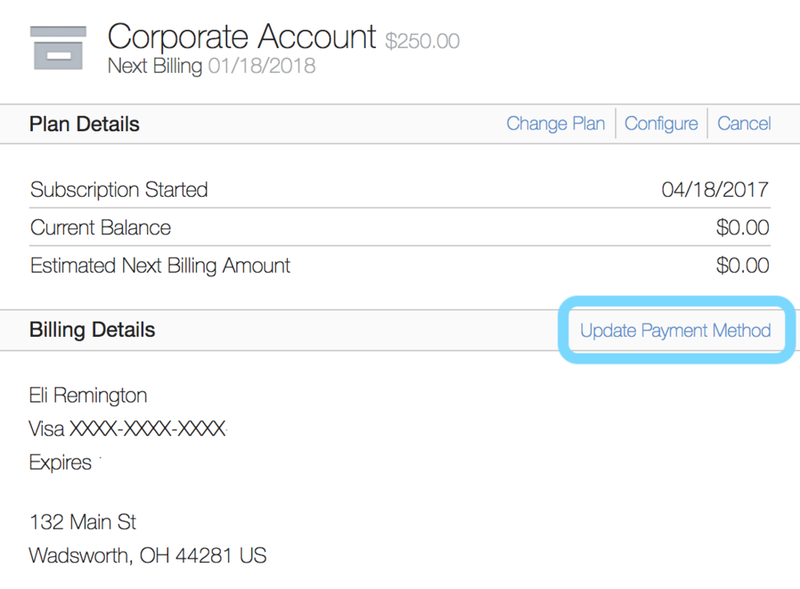 On the "Edit Payment Screen," you can change your credit card information and your billing address. Click the blue "Save" button to save your updated information. If you need to look at a previous billing statement, you can click on the "Statements" section in Bezlio's billing center. You will see a list of all of your previous monthly billing statements. You can see the billing dates, amounts, and account details. To view one, click on the statement's line. On the invoice detail page, you can view all of the details of the statement. Click the download PDF button to save a copy.